Zonta Says No is a worldwide campaign of Zonta International to end violence against women. The 2013 District 12 Conference was great! The District 12 Conference in Canon City is only days away. Plan to attend! 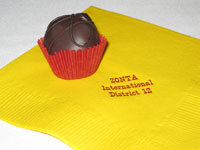 Plan now for the 2014 Zonta International Convention in Orlando Florida USA. It will be the 62nd convention on June 27th to July 1st and the details and registration information is located at http://orlando2014.zonta.org.